Safety imperatives affect all sectors of farm production; many operations, machines or situations are potentially a source of accidents or could lead to problems such as musculoskeletal disorders (MSD). For many years, manufacturers have been trying to make their machines and their internal components less dangerous, often surpassing applicable legislation. In this way, Claas offers the Torion Sinus wheel loader (Bronze Medal) fitted with a double steering system comprising a central articulated joint plus a rear steering axle which improves the manoeuvrability and stability of wheel loaders. The system reliably and safely combines the advantages of the two steering methods regularly used on loaders: a central articulated joint, which offers the advantage of pushing in-line with the front axle, (but reduces rear overhang when manoeuvring and increases the risk of accident), and four-wheel-drive which is safer when turning (which has the disadvantage of not pushing straight on a bend). Another source of serious accidents relates to when machines block up and the temptation to unclog them by hand. To prevent this, New Holland Agriculture proposes a DFR reverser system (Bronze Medal). When a machine blocks up, the Dynamic Feed Roll reverser enables the operator to remove blockages without leaving the cab. 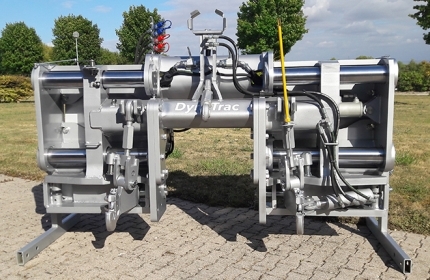 The system comprises a hydraulic actuator, a ratchet system and a toothed wheel on the DFR shaft. When this blocks up, the system warns the operator via the cabin display. The operator can then safely start the unblocking procedure which includes reversing the rotation direction of the DFR and that of the conveyor belt. The safety of operators is also put at risk when exposed to products that are potentially hazardous for their health. In order to reduce these risks, Kverneland offers a new microgranule distributor for precision drills (Bronze Medal), designed to mitigate the risk of contamination due to exposure to crop protection products which make up the microgranules. Isolating the full hopper and redesigning the way the metering wheel is removed eradicates the risk of contaminating the operator through contact with the crop protection microgranules during metering wheel changeovers, even when the hopper is full. In the area of heavy machinery, the phases of hitching and unhitching three point carried implements are well-known at-risk situations. These risks have grown greater with larger implement sizes and the use of particularly heavy hydraulic push bars. To address this substantial risk, Hydrokit has designed a “Third hand for top link” kit (Bronze Medal - cf photo above). This kit, which can be fitted to any tractor, comes in the form of an electrically-controlled winch that helps the user to hitch and unhitch the hydraulic push bar (the top link) behind the machine and couple and uncouple the machine’s transmission shaft on the tractor. It thus reduces the effort required and the risk of musculoskeletal disorders, injuries and crushing accidents during these two types of operation. In the field of livestock, risks mainly relate to the behavior of animals which could either charge at the breeder or take advantage of a poorly-closed gate to escape. The wide gate with Surlock by Jourdain (Bronze Medal - cf photo below) consists of an easy-to-use locking system for gates. Easy to open for the breeder, the lock functions in both directions. It locks with a simple push. 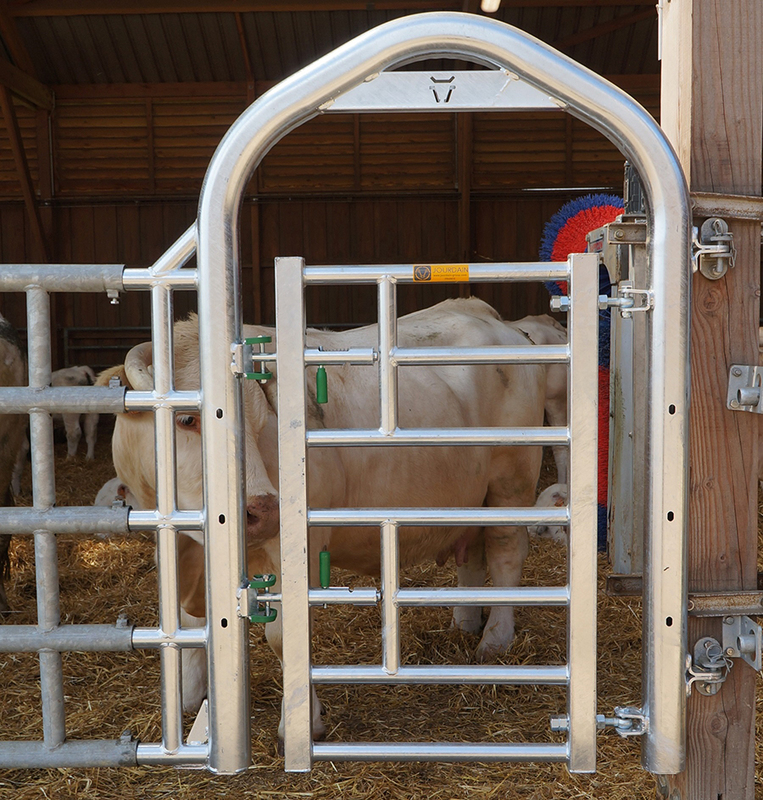 In animal husbandry, gates are opened and closed several times a day; the Surlock system offers breeders a simple and safe system to use every day when working with animals. Finally, the cleaning and disinfection of animal sheds are tasks which are often difficult and painstaking. The Lavicole system designed by Rabaud (Bronze Medal) is a remote-controlled livestock shed cleaner. This system provides greater convenience and ease of work for cleaning tasks. The operator steers and monitors operations remotely using a remote control. They are less exposed to splashes from water and dirt and no longer have to carry out repetitive and tiring movements with the highpressure gun.